I am a Nature’s Sleep Ambassador, hashtag #NSAmbassador. Being a brand ambassador means that Nature’s Sleep provided me with a Diamond Gel Memory foam mattress to sleep on and test in return for my honest opinions and amplification via my social media space. I was not provided any other compensation of any kind. I value my time and image, and closely evaluate if the brands I work with are a natural match for C8C, feel authentic and fit with my demographic. All opinions I express, plus any ideas and photos I share, regarding the mattress and other products are my own (and sometimes HIMself). I have a nightly ritual to help me relax before I crawl under the covers. It is my ME time…and I have been doing it for years. If you checked my nightstand you would see an unusual array of items. Yes, this creative girl closes her day with a few of her favorite things. I am so busy with work now that pure creative time is often limited. So I jump into my cool memory foam mattress (from Nature’s Sleep) and snuggle in to meditate, pray, draw and chill!!! Here are some pages from my journal. Nature’s Sleep is having a sale on our Vitex Memory Foam Pillows until Saturday, August 31. I sleep on these myself. You can read about it here. 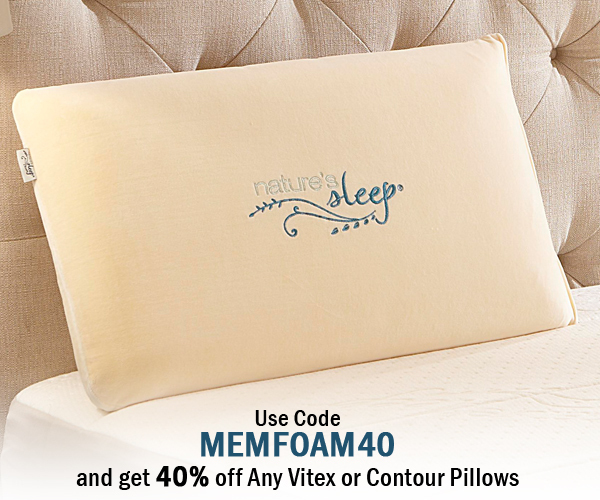 The Vitex and Contour Memory Foam pillows will be 40% off regular price with FREE shipping. The coupon code is MEMFOAM40. This offer is valid for the US only. The three pillows on sale the week of August 25-31 are the Vitex Memory Foam, the Vitex Contour, and the Visco Memory Contour. Are you wondering which pillow might be right for you? The Visco Memory Contour Pillow is a contoured shaped pillow with a thicker and thinner side. Moderate density Memory Foam cradles your head and neck. The washable cotton velour cover is very plush and very kind to the skin. It is a wonderful pillow for those with neck pain, snoring, or breathing issues. The Vitex Memory Foam Pillow is very similar to the Visco Memory Contour pillows but with a softer, plusher feel. Incredible support helps align your spine, head and neck. When sleeping on the Vitex pillow you will feel supported in a softer, gentler way. The Vitex Memory Contour Pillow offers a contoured shape that many sleepers prefer. It includes two washable velour covers for increased durability! This pillow has the feel of our Visco foam, with the recovery of latex! Its inner cover is handwrapped with 100% cotton. Nature’s Sleep pillows are hypoallergenic, antibacterial, and dust-mite resistant. Pillows are CertiPUR-US approved for your safety. Use coupon code MEMFOAM40 to apply savings at checkout. This sale will run 8/25 to 8/31 and is valid for the US only. You and I have pretty much the same items on our bedside tables and pretty close to the same nighttime routine. It really helps to take a few moments to let go of the day doesn’t it?